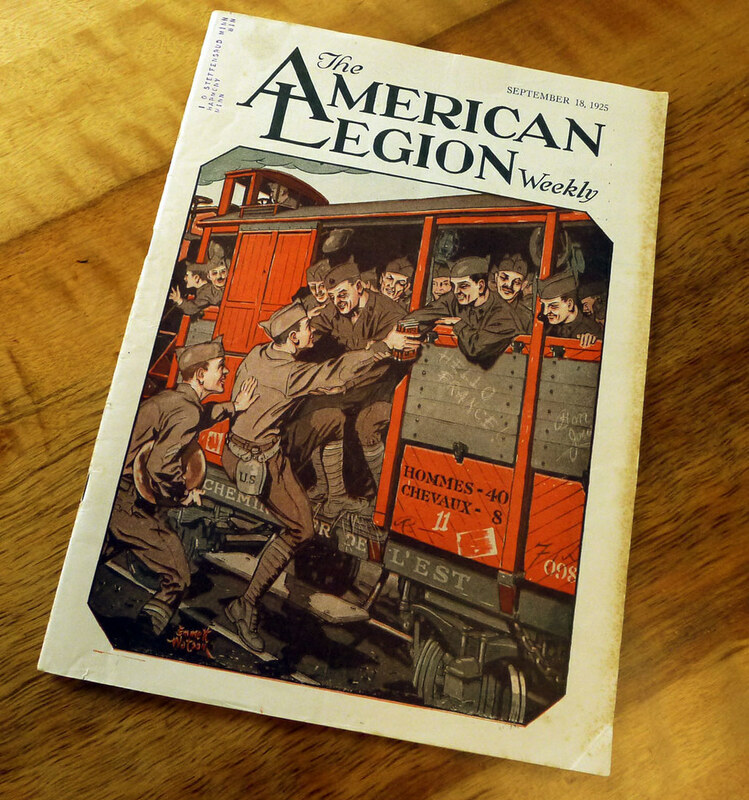 In the 1920’s the American Legion Weekly reached a large audience, mainly that of veterans returning home from Europe after World War I. 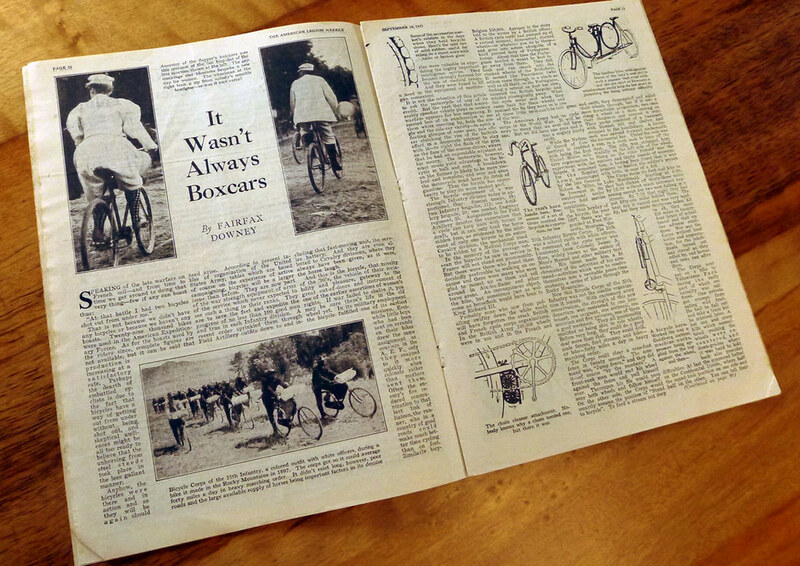 The publication covered a variety of topics, but one, I haphazardly found, focused on bicycles. 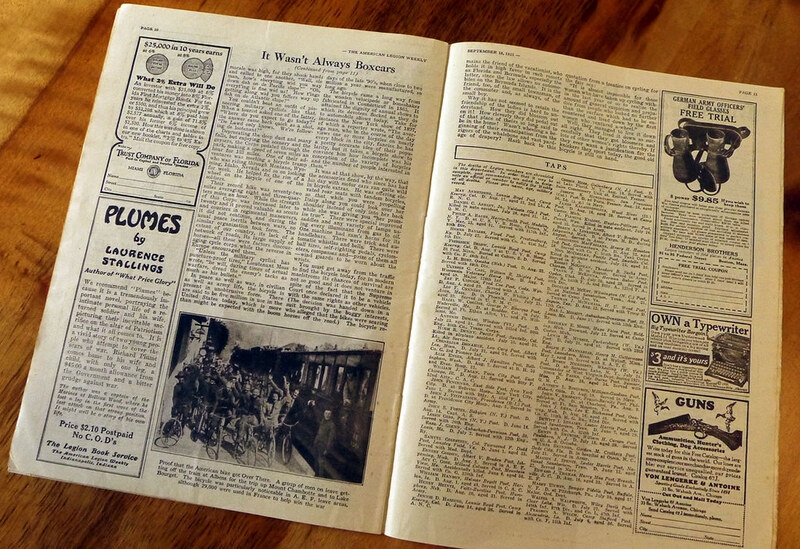 Although this is a bit earlier than what I would consider my focus within the realm of vintage cycling, it nonetheless gives some fascinating history on cycling and its impact during the “Great War”. 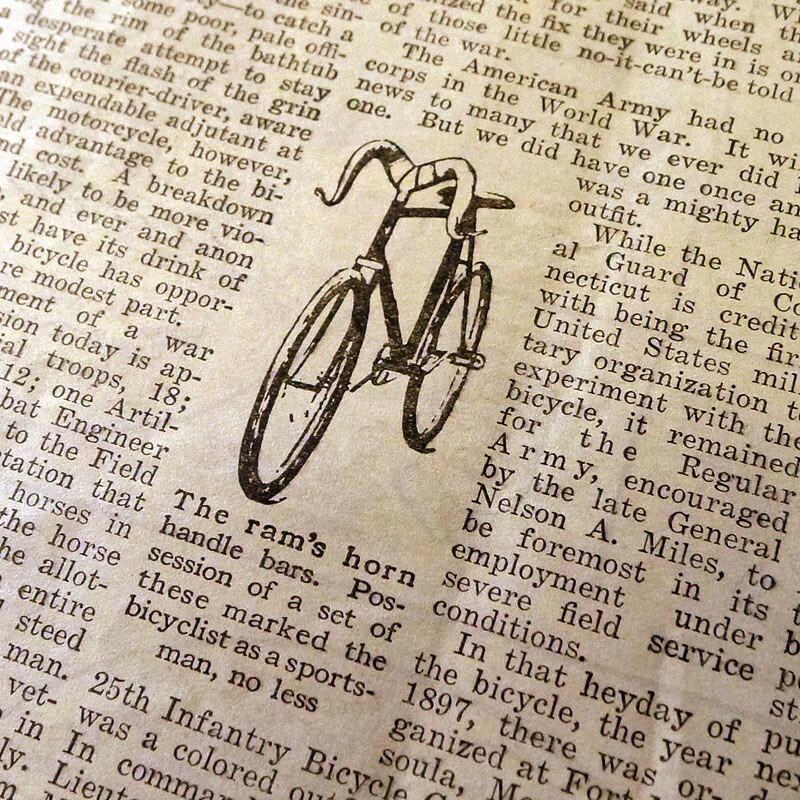 The 3-page spread gives stories and accounts on how the bicycle had serious need in times of battle and during other periods when light, quick mobility was needed by the Corps stationed in Europe and throughout the United States. The piece first features images of a flapper in knickers and a woman in bloomers near the headline, however this is really quite misleading as the article really has nothing to do with either. 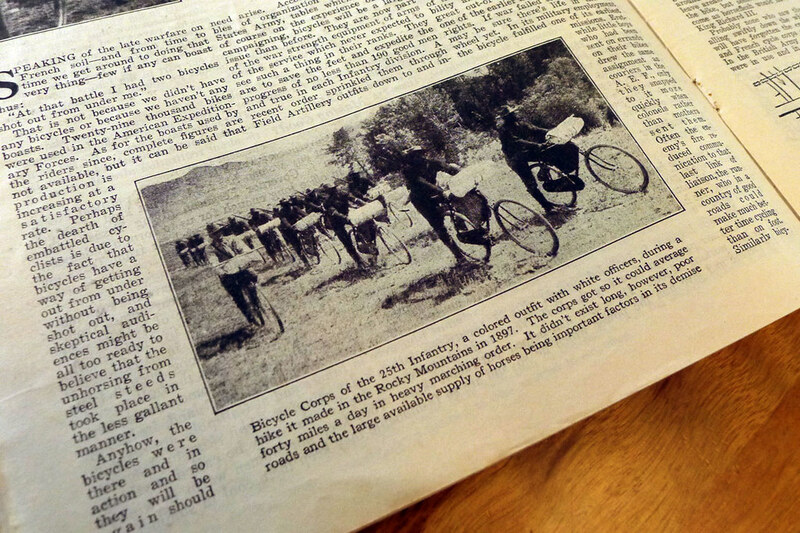 The meat of the story really begins with the image below, which showcases a group of Bicycle Corps riding through the Rocky Mountains in 1897. “The Corps got so it could average forty miles a day in heavy marching order. It didn’t exist long, however, poor roads and the large available supply of horses being important factors in its demise”. From the image, I cannot imagine how rough that terrain must have been, especially on those boat anchors! The story goes on to describe some interesting facts. 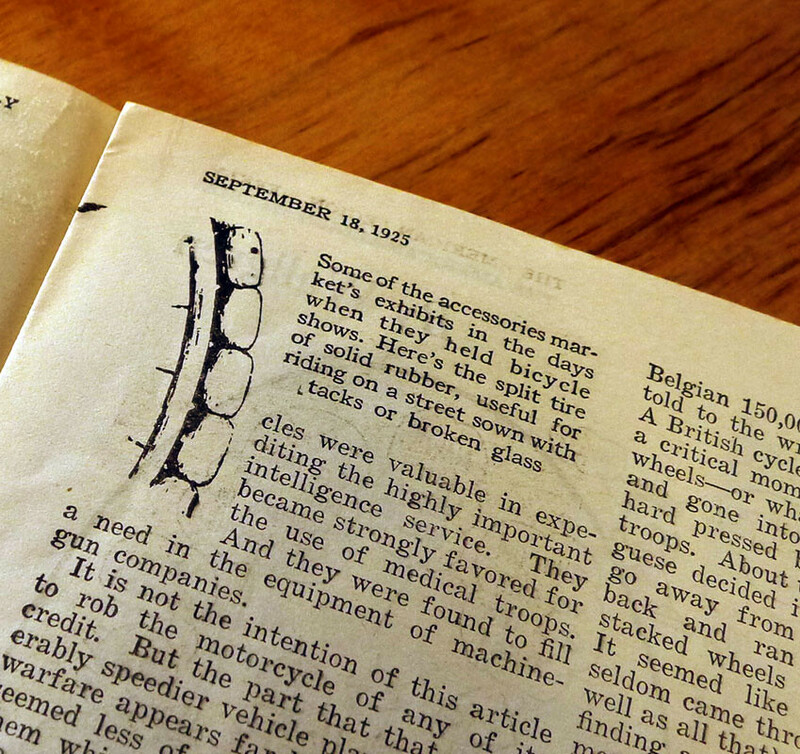 Apparently, 29,000 bicycles were used in the American Expeditionary Forces during battle time while on French soil. The biggest problem faced was that the infantry was having the wheels shot out from under them. It was not uncommon for riders to ride 3 or 4 bikes during a battle. 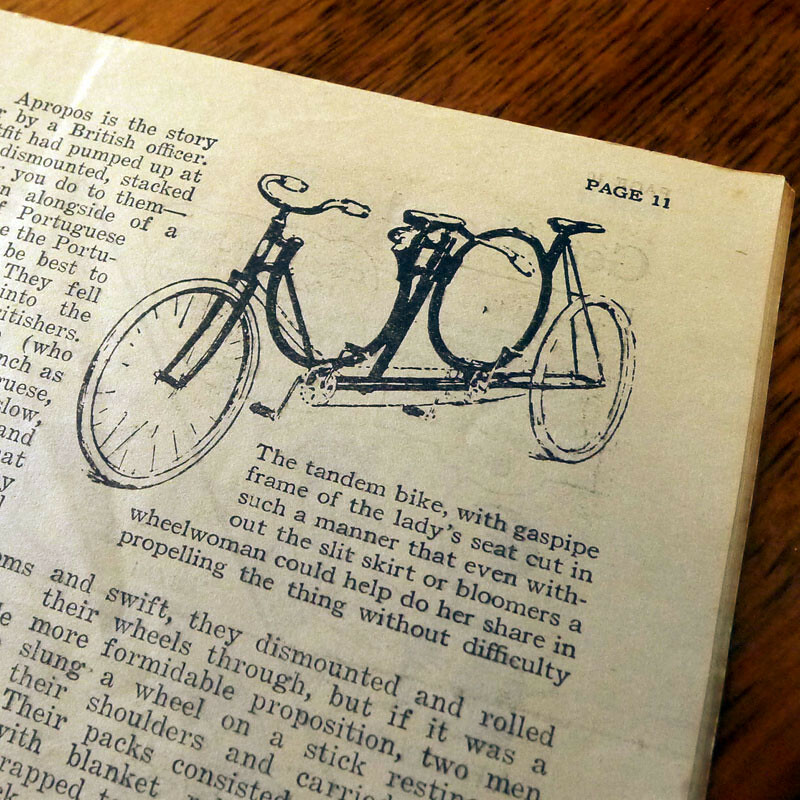 The British also used bicycles. 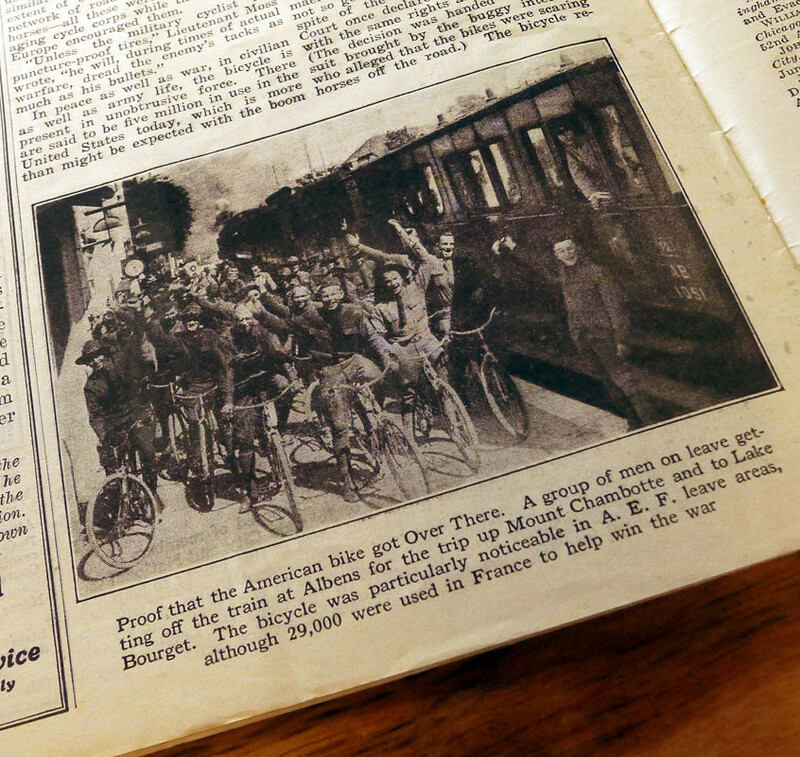 They had 100,000 wheels at their disposal and the French and Belgian army had a staggering 150,000 bicycles ready to go! Who knew!? Out of the three pages of tales, firsthand accounts and facts, the most interesting was how the soldiers adapted to the extra piece of equipment. I don’t know if you caught that above but this little drill took twenty seconds to accomplish! This shakes my bones just looking at it! Literally ram’s horns handle bars! Perhaps this could be the first steps toward creating a Dutch style frame? Lastly, I leave you with a quote that gives a couple of slightly backhanded compliments to the bicycle but some certain element of the paragraph still fits our times, 87 years later (i.e., commuting). 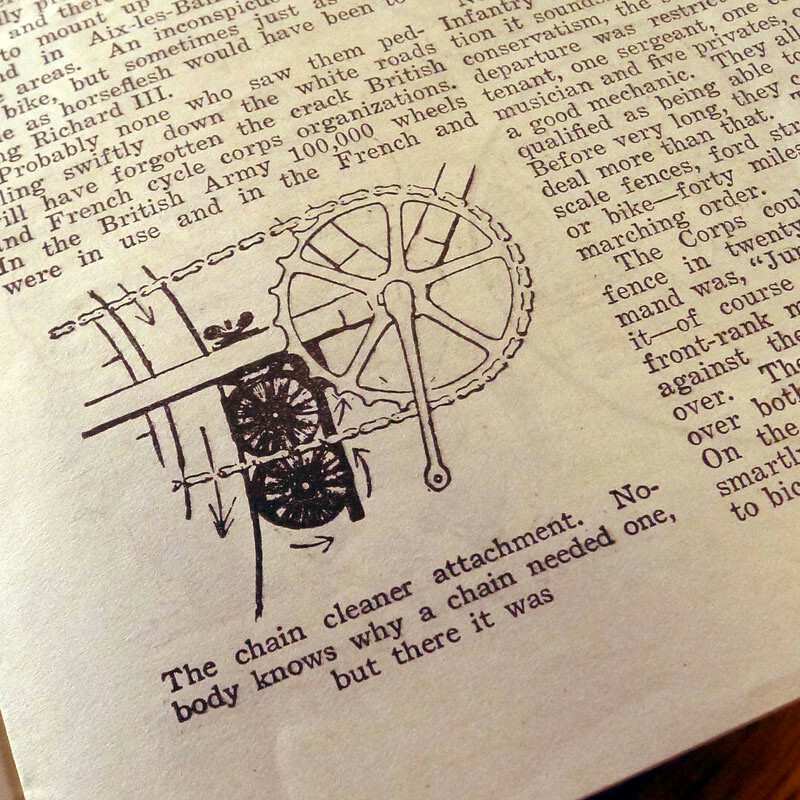 This entry was posted on June 12, 2012 by Josh C. in Cycling in Print, Topics and tagged American Legion, Bicycle Corps, BIcycles during war, Chain Cleaner, Female Tandem Bicycle, Skip Tooth Crank, Split Tire.